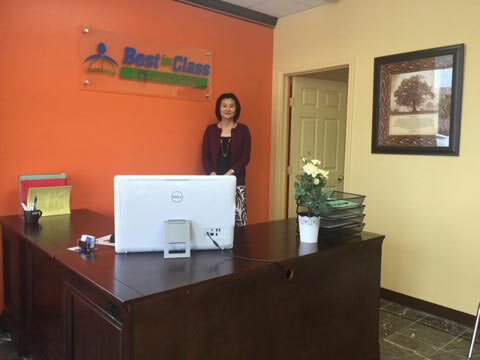 Best in Class (BIC) Education Center is opening its first location in Sugar Land. Their grand opening event will start at 10:00 a.m. on Saturday, August 20. Local owners and Chinese immigrants, Helena Liu and Jerry Li are eager to welcome their new business to the community. Helena came to the U.S. 18 years ago with her husband, supporting his career as a metal material processor. With substantial travel required for her husband’s job, she received a variety of degrees in order to maintain a steady job including a Master’s in Computer Resources and Information Management and a Bachelor of Science in Nursing. Jerry was involved in corporate business ventures in China before immigrating to the United States 3 years ago. He was seeking franchise opportunities that mirrored his passion for working with children, and saw something special in BIC after enrolling his son (Nikki) in one of their other locations. Combined with Helena’s skills and experience, the two decided it would be a great partnership to open the Education Center. Not only to offer a challenging, non-repetitive, successful teaching style for children, but also to help transitioning immigrants in the greater Houston area achieve academic success. They aim to open two to three centers over the next three to five years.